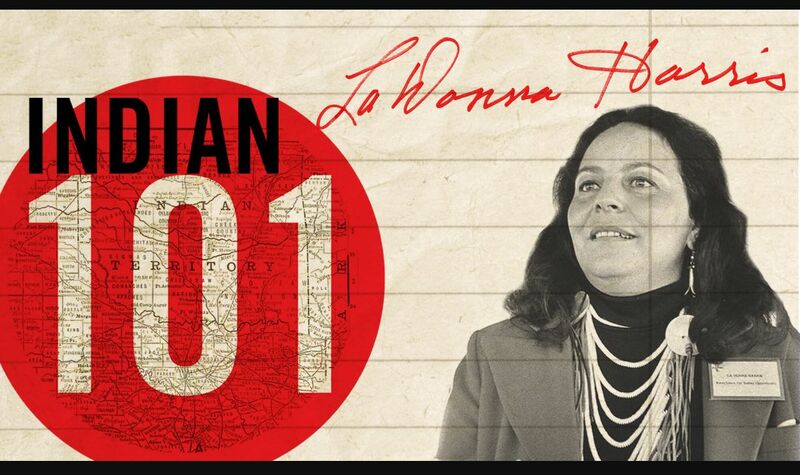 “LaDonna Harris: Indian 101” is about the indigenous upbringing, life, and work of LaDonna Harris, a Comanche political leader. Harris will be speaking alongside David Coquehuanca (Aymara, Bolivia) and Pamela Palmater (Mi’kmaw, Canada) at UT on October 13th in the Quadrangle Room at the Texas Union. This panel is sponsored by the Native American and Indigenous Studies Program (NAIS) at UT Austin. Harris’ visit is a great honor to the Comanche Nation and its descendants. This screening is one event in our first ever Indigenous Peoples’ Week! Harris is the founder of American Indians for Opportunity (AIO). AIO advances, from an Indigenous worldview, the cultural, political and economic rights of Indigenous peoples in the U.S. and around the world. Harris has many achievements in her leadership, which include being the vice presidential candidate for the Citizens’ Party, and helping the Menominee tribe regain federal recognition after their tribe had been terminated by the US government.